You have two weeks left to turn in your entries for the UNBOUND Book Art & Craft Contest – it’s not too late to start something! If you need some book art inspiration, check out how these nine illustrators use books and found images in their collage work. See if you can identify all the kinds of papers these artists used! Almost all these books can be found at the Montclair Library. Jeffers peppers his work with bits of ledger books, old engravings, book pages and more. The Incredible Book Eating Boy (J PICBK JEFFERS) is a great example. You can also see fun papers and postcards collaged into Jeffers’s illustrations for The Day the Crayons Quit and The Day the Crayons Came Home, by Drew Daywalt (J PICBK DAYWALT). Sweet uses notebook paper, graph paper, book pages, newspaper and other found papers along with her colorful painting to bring to life stories like A River of Words: The Story of William Carlos Williams by Jen Bryant (J BIO WILLIAMS). Sweet’s collage illustrations are also on display in her own book, Balloons over Broadway: The True Story of the Puppeteer of Macy’s Parade (J BIO SARG) and in Firefly July: A year Year of Very Short Poems selected by Paul B. Janeczko (J 811.54 FIREFLY). There are no Fanelli books at Montclair, but her work is so inventive it’s worth seeking out books like Pinocchio by Carlo Collodi (J FIC COLLODI) or My Map Book (J PICBK FANELLI). Perhaps best known for books like Swimmy, Lionni shows off his collage skills in Inch by Inch (J PICBK LIONNI), about an inchworm measuring birds as he tries to keep from being eaten. Ehlert uses found objects and paper to bring a goofy dog to life in Rrralph (J PICBK EHLERT). For some background about her life and her process, check out Ehlert’s autobiography, The Scraps Book: Notes from a Colorful Life (J BIO EHLERT – not at Montclair). 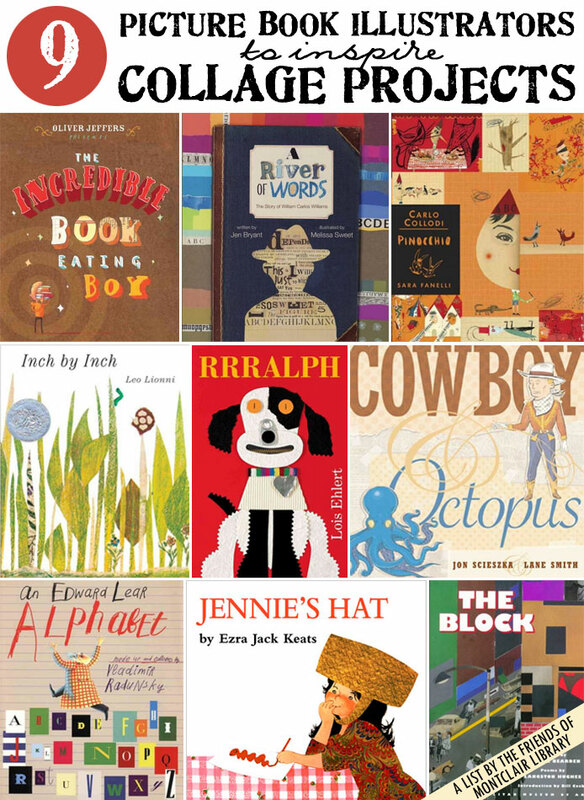 Smith uses a variety of illustration techniques in the many books he’s worked on, including fun collages featuring everything from comic books to fabric in the wacky Cowboy & Octopus by Jon Scieszka (J PICBK SCIESZKA). This one’s not at Montclair, but Radunsky’s bold, quirky collages pair well with Edward Lear’s nonsense verses in An Edward Lear Alphabet by Edward Lear (J 821.8 LEAR). For a Montclair example of Radunsky’s work, try Table Manners by Chris Raschka. Keats used torn and cut paper in some of his most famous works, like The Snowy Day, but my favorite example of his collage work is the exuberant illustrations in Jennie’s Hat (J PICBK KEATS). Drawing inspiration from everything from patchwork quilts to Henri Matisse, Bearden’s work often involved collaging cut up photos from magazines. For good examples, see his illustrations for The Block: Poems by Langston Hughes (811.52 HUGHES). Lastly, I didn’t include them here because they tend to not to use found papers, but Rebecca & Ed Emberley (who use primarily construction and tissue paper) and Eric Carle (who makes his own hand-painted papers) are of course rock stars of collage picture book art.